We don’t celebrate celery enough. How many times have you bought half a bunch of celery because you couldn’t work out to with the rest of the bunch. This salad solves that problem for you: it tastes sensational, uses five large stalks of celery, but it also keeps excellently in the fridge for a few days so you can always double the recipe and rip through almost a whole bunch. If you’ve still got some stalks left you can always pickle them like here and throw them in potato or egg or tofu salad or indeed any kind of salad. I’m familiar with this kind of Chinese salad because my local Tawainese dumpling joint has a whole range of chopped vegetable salads most of which heavily feature celery alongside various combinations of tofu, seaweed, cucumber and carrot. 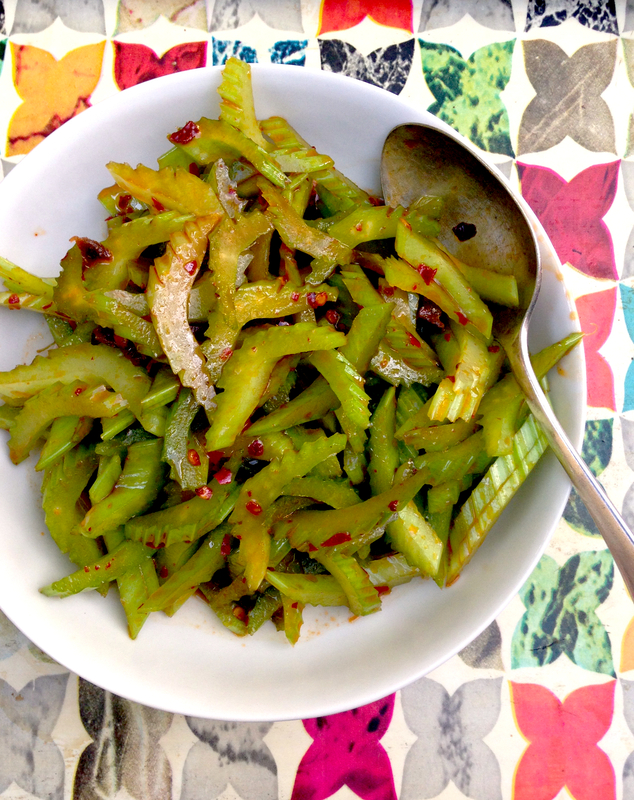 This celery salad goes well with any Asian style meal and is a nice crunchy side for dumplings, braised tofu and a good offset to the richness of coconut based curries. Just a note on the ingredient spicy chilli crisp otherwise known as La Gan Ma or sometimes as grumpy Godmother chilli oil. This is worth tracking down in your local Asian grocery store. It adds a extra unami twist to all manner things. A dash of chilli crisp works a treat in fried rice, noodles or combined with soy sauce and Chinkiang vinegar as a dumpling sauce. It goes well with most Asian food but it’s flavor profile is also surprisingly sympathetic to Mexican food, so try some next time you have tacos or black beans and rice. Mix together soy sauce, sesame oil, rice vinegar, chilli crisp and sugar in a medium bowl. When sugar is dissolved mix through celery and allow to rest for about an hour before eating. Leftovers keep well in the refrigerator for several days.